Holistic dentistry, also known as biological dentistry, takes into account a patient's dental health considering their entire state of physical and emotional health. At Sterling Dental Clinic, we strive to use natural therapies (often in combination with conventional ones) to diagnose, prevent and treat diseases of the oral cavity. It is estimated that 80% of the chronic degenerative disease originates in the mouth. According to reports, dental amalgam fillings are the primary source of mercury exposure for the general population. In fact, mercury has been known to stay in the body for up to a year. Dentists practicing holistically look at the complete wellbeing of the patient, not just the gums and teeth. 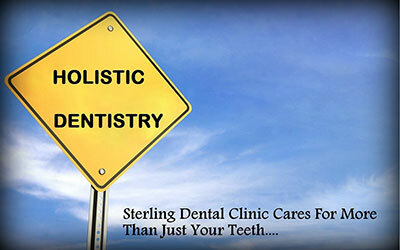 At Sterling Dental Clinic, we do not use amalgam, nickel, or other metals to fill cavities. Instead, we use composite resin which is a much healthier material. We take the utmost care while restoring teeth. There are several choices of non-toxic dental materials available. Composites (also known as bonding), porcelain and gold are all available. In Dr. Tarun's years of experience, he has narrowed his material choices to specific holistic materials. Thus, there are no known traces of either metals or other elements that might affect the patient's health. Dr. Tarun also takes the time to explain the patient's condition and give options (i.e. fillings verses inlays/onlays) to suit their finances and wants. Holistic and integrative approaches are important in any area of medicine, and Dr. Tarun believes that dentistry is no exception. The patient can feel free to ask him questions such as the types of materials used in his clinic for dental procedures, whether they use digital X-rays, and how they dispose of medical waste. He also does not necessarily agree or conform to all traditional practices among holistic dentists. In particular, he believes that removing existing amalgam fillings is pointless, expensive and stressful to the patient. He advocates evaluating fillings and exchanging the amalgam for composite resin only when they break down and need to be redone. At Sterling, the patient's wellbeing is our priority.